Qingtian River scenic area is located in the territory of the fraternity County of Henan Province, Jiaozuo City, is the world geological park, the state 5A class tourist area, national key scenic spots, National Water Conservancy Scenic Area, national macaque nature reserve. Scenic area of 106 square kilometers, from the courtyard view, big spring lake, Sangu fountain, a Buddism godness Guanyin gorge, Buddha ear gorge, Jin Jia Ling, Yueshan temple seven tour area, 308 attractions. Qingtian River "mountain" compatible with the north and the south, both the North mountains male risk potential, and southern special soft state; Qingtian River "water" heaven, here are the three steps a spring, the five step of a waterfall, Castle Peak around the green water, green trees cover temple. Here is the world the one and only natural wonders of the world the Great Wall and partridge eggs; "the first Chinese Spring" Sangu spring and the spring to form a 7.5 kilometer long big spring lake. 70000000 years ago the only written records of the world rare natural Buddha body, have Chinese most early men a Buddism godness Guanyin statue, there are now in 1500 the Northern Wei Dynasty and Northern Wei Gu Dan cliff stone, is with the Shaolin Temple world, Emperor Qian Long had three times the worship of the Millennium Temple Yueshan Temple, has the largest area Chinese one hundred thousand acres of the red forest, red spot Jin Jia Ling, is a cloud float Miao, the air pleasant natural oxygen bar and forest parks. Qingtian river landscape Zhong Ling Yuk Sau, Gu Dan Tao a Buddism godness Guanyin efficacious beautiful. 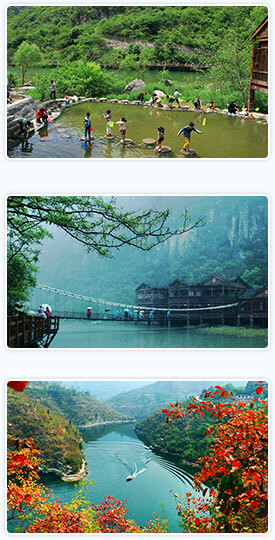 When you stroll in the Qingtian River, whether in a Buddism godness Guanyin spirit worship Buddha station, or take a tour of heart in the Buddha ear gorge, or in Yueshan Temple deep in the forest in search of the master Zen enlightenment, can purify the soul, the true meaning of life taste, experience different artistic conception.